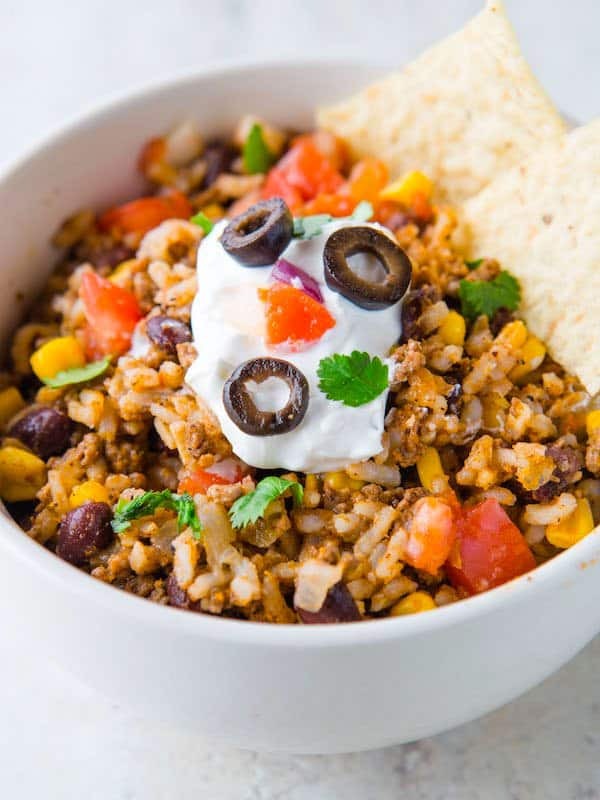 Inspired by classic beef tacos, these tasty bowls are made with ground beef, black beans, rice, and salsa. They’re loaded with flavor and only take 10 minutes to cook in the Instant Pot. 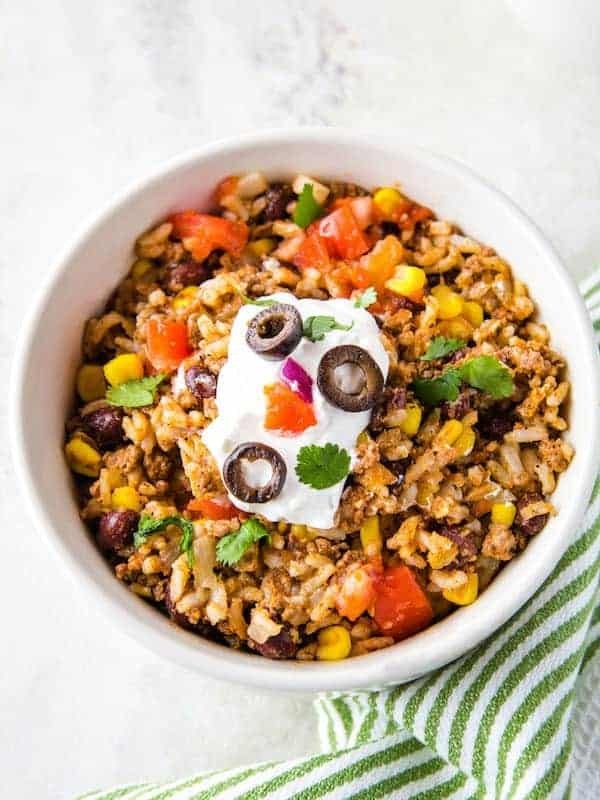 Like my original burrito bowls, this recipe calls for long-grain white rice. Don’t replace it with either instant rice (you’ll get mushy rice) or brown rice (the brown rice won’t cook in five minutes). Use low sodium or no-sodium chicken broth. My favorite is Kitchen Basics. Some folks ask why I suggest a low sodium broth when I call for adding salt to the recipe. It’s all about control. You get to control how much salt you add instead of leaving that up to the broth manufacturer. And if you make homemade chicken stock, you can use it in this recipe! Simply replace the broth with your stock. Chili powder brings a lot of flavor without bringing a lot of heat to this recipe. Skip those packets of “taco seasoning”. They contain both salt and a thickener which adds an odd consistency to this recipe. I used Penzey’s regular chili powder. It’s loaded with flavor but not a lot of heat. If you want to add a spicy kick to the recipe, add a little chipotle powder or, for a really spicy kick, add a pinch of cayenne pepper. 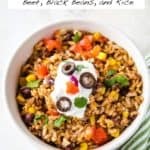 For this recipe, I use the same Chi-Chi’s salsa as I did in my chicken burrito bowls. It’s a simple salsa that adds lots of flavor. Use whatever salsa you love. Just note, however, that if the salsa you use is thin, it can make the rice mushy. You’ll notice the recipe calls for canned black beans. Some folks wonder why I use canned beans in a pressure cooker recipe. The answer is simple: cook time. Dried black beans would take too long to cook and the rice and meat would be overcooked by the time the beans were done. Frozen corn adds a nice flavor and texture to these bowls. If you follow a corn-free diet, skip the corn. It won’t impact the final recipe at all. Saute the onions, garlic, and spices. Cook the onions and garlic for about two minutes. This step removes the sharpness from the onions and garlic. It’s an important one. Don’t skip it. Deglaze the pot. To avoid getting a “burn” notice, add about 1/4 cup of chicken broth to the pot after you cook the onions. Using a wooden spoon, scrape the bottom of the pot to remove any cooked-on bits of meat or onions. Once you’ve scraped the bottom of the pot, go ahead and add the remaining ingredients. Cook on high pressure. This recipe requires only 10 minutes under pressure. The pot takes several minutes to reach pressure. So plan on about 30 minutes from start to finish. Shredded cheese, such as Cheddar, Monterey Jack, or Pepper Jack. 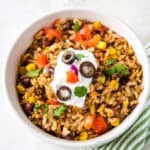 Instant Pot Beef and Black Bean Taco Bowls. Cooks in 10 minutes under pressure. Loaded with flavor! Set electric pressure cooker to the high saute setting. Heat olive oil until it shimmers but doesn't smoke. Add the ground beef. Cook, breaking up meat as it cooks until no pink spots remain. Drain excess fat. Add the onion and cook until soft, about two minutes. Add the garlic and cook an additional minute. Turn off the saute setting. Add 1/4 cup of the chicken broth. Deglaze the bottom of the pot, scraping off any cooked on bits of beef or onions/garlic with a wooden spoon. Add chili powder and salt. Stir to combine. Add black beans, rice, salsa, and corn. Stir. Pour remaining chicken broth over the mixture. Stir to combine. Serve with your preferred toppings.